Orjetax wrote: ... How does the "consequences for PC death" practice impact play on the tabletop? Are all "PC" models loaded with as much equipment or other benefits as possible in an effort to prevent the chaos of character death? Or do your players take a more RPG-view and appreciate character death and its consequences as part of the fun? 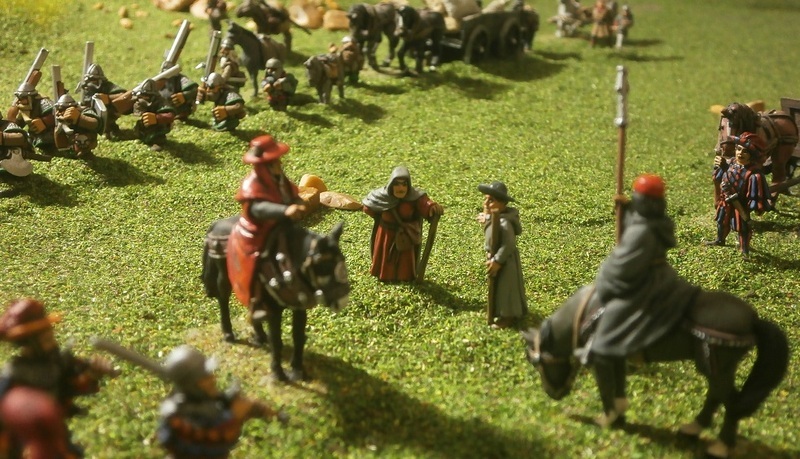 There was a battle in which the scenario was that she was trying to escape being killed or captured by her cousin, advised by her council that her town was doomed (see viewtopic.php?p=35374#p35374). The subsequent battle report showed her at the last moment escaping (see viewtopic.php?p=35478#p35478). The whole report was accurate except for the very last part - in truth, she did not escape. I had to report it this way because the vampire player said he was going to make her a vampire, beholden to him as her sire, and then use her somehow as a pawn/spy/saboteur. I did plant clues, like the fact that she disappeared for some time and then reappeared unexpectedly, and every time I described her I dropped heavy clues. Examples include when I described Lord Guglielmo saving her by fighting the vampire duke: "Somehow, though no living witnesses can explain how it was so, he survived just long enough to save the duchess. Finally, as she fled into the hills, the vampire’s cold blade, a horribly curved butchery tool, carved him in twain." Notice how I basically report there was no living witnesses to this rather incredible event? Later Biagino expressed his surprise when she arrived at the city: "The Duchess Maria had been missing for nigh upon two months, and in the second month it had become generally presumed she must have been killed after her flight from the battle before outside her city of Ebino. Now it seemed that those few who had claimed she was hiding, waiting until it was safe to continue her journey, had been right." It only 'seemed' that way though - see? So the vampire player said he would keep it in the family and become the vampire duchess, not Adolfo, not Hackspitt, nor anyone else. This meant he now commanded a much smaller realm and army (Viadaza instead of Miragliano) and couldn't simply order the other vampires made by the duke, for they were in terms of the gift of vampirism, not the vampire duchess's to command. The undead advance southwards now stalled for some considerable time as the vampire duchess went north and defeated the other vampires by treachery. She tricked them into meeting for a parley and then launched an attack (I did warn the player if she lost the fight then it would knock him back even further in campaign power, but he went for it anyway). We fought a secret little 4 model skirmish on a bridge - her and Adolfo versus Theobald Hackspitt and another vampire hero he had sired.) She won, and then spent a while securing Miragliano and her own possession (when alive) Ebino. Little mention of this is in the reports because it's not the sort of thing that living Tileans would find out! If the player had chosen to be Adolfo, he would have been effectively in the same situation, although would have to deal with being under the spell of the NC duchess. If he had become Theobald then he would still have a reduced/damaged army, plus being in retreat, plus having vampires as enemies too. There would have been 'consequences' whoever he chose. (Note: In terms of gameplay, consequences that are reflected on the tabletop would be stuff like having to roll on the character injury chart. We have recovery rules for fallen characters (not overkilled ones though, they are very definitely dead, and this includes if a cannonball does more wounds than a character has left). If they survive, they have to roll on an injury chart - results can be permanent, and can include becoming a prisoner. We don't seem to use the chart much though, as characters seem to be very obviously dead. We even have rules for trying to capture an enemy character rather than kill him - although I can't recall the last time that was tried. So you can see it can be complicated. There can also be a LOT going on that is only hinted at in the reports and stories. And the stories can even be used to distract and/or give clues at one and same time! You could contrast this with the player of Duke Guidobaldo Gondi of Pavona (he plays a great tyrant - his ideas are always as cruelly efficient as they are unexpected to me). His own RL son (aged about 9) was theoretically playing his game world son, Lord Polcario, yet even so, the player didn't want to risk his own character's life and sent his son up a ladder to fight a challenge against Prince Girenzo of Trantio (see viewtopic.php?p=44771#p44771). Young lord Polcario died. His RL son was sad! And boy did we feel guilty. Cue the Duke's player saying: "I have another son, you know!" The boy now technically plays Lord Silvano, his youngest son, although the real world lad in question still thinks we adults are playing the slowest and most boring game ever invented by man. Other players don't even send their character into battle - if they're not on the tabletop they're a LOT less likely to die! 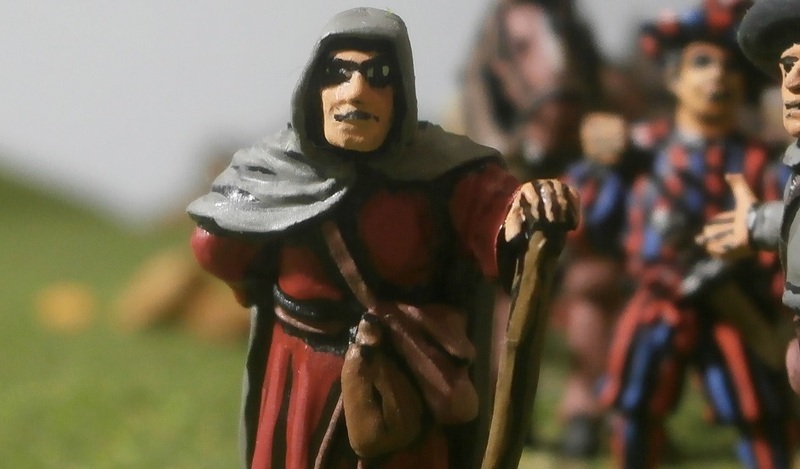 Short answer to your other question: Players equip their characters according to their army books or campaign composition lists. Some do it with roleplaying in mind too. I just noticed this, how are you hiding the bases? I greatly enjoy these glimpses behind the curtain. I hope your gaming pals know how lucky they are to have a Padre. The scope and intricacy of this campaign is impressive. Also, as a parent, I'm much amused by the anecdote of the young Lord Polcario. @ Ardyer: Main base-hiding technique, and by far the easiest, is flock (by the tub) sprinkled then brushed up to conceal the black base edges. I have no 'before' photos as I always delete them from my camera saving only the finished photo. It's a faff to do, so I tend to position the figures and scenery, check the photos are gonna work (ish) then I do the flocking before taking the finished photo. Sometimes I cleasn up with MS Paint. I used a clothes brush to sweep the flock back into the tub (over the edge of the table). I wish I'd thought of this technique years ago, or even before I commenced this campaign, but it only occurred to me relatively recently. I never used to mind seeing the bases, but once you've begun concealing them it's hard to go back! I've been terrified for months now that flock will go out of fashion and I won't be able to get any more! For real? Or a joke lost in translation on me? I think you can sleep safely at night, I'd say it's here to stay. The railroad modellers have been using it for decades and it's probably not going away anytime soon. Sorry, Gallivantes. That was indeed what passes as a silly joke in my head. I should use more smilies. @padre I wondered if that's what you were doing but I couldn't fathom that you'd go through all that labor! Thanks Shaun. I have to admit, I really enjoy putting archaic or unusual words in, and using tricks like onomatopoeia and illteration etc. Here's the next piece, prequel to a very large battle. 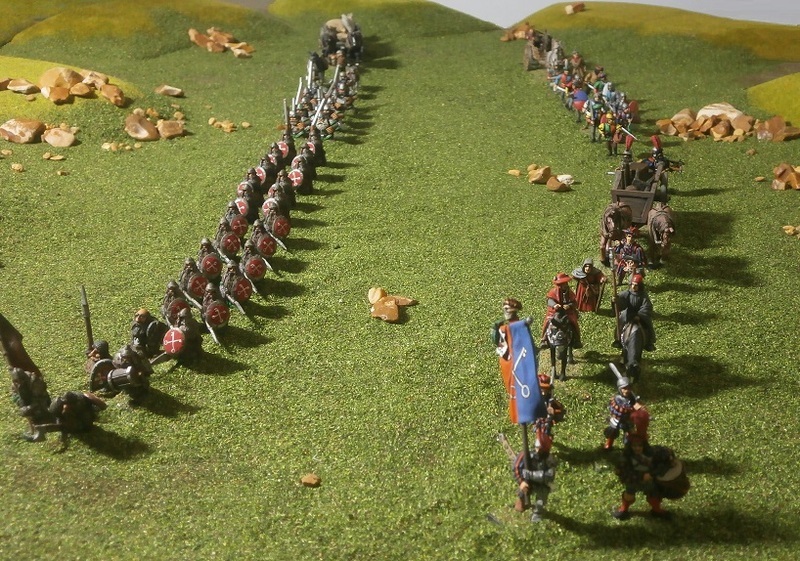 Duke Scaringella and his Reman army marched in the van, as was proper now they were moving through their own territory. The whole force, Pavonans included, was comprised mostly of foot soldiers, along with baggage and a large artillery train, which one might presume would critically limit their speed, ruining their chances of successfully catching the brute foe ahead. This was not so, however, as both armies were pushing themselves hard – the Pavonans keen to exact revenge for the multitude of insults done to them and theirs by Razger Boulderguts’ ogres, and the Remans desperate to ensure their own realm would not suffer a similar fate. Every effort had been made to ensure a good pace, including assigning the Pavonan’s large pistolier regiment to assist the artillery’s passage in every way they could. Although their poor horses would doubtless be in no fit state to fight when it came to battle, the brute foe would be subjected to battery by a storm of iron round-shot rather than the paltry peppering of leaden pistol balls. Towards the rear of the Reman column rode the newly elected arch-lector of Morr, Bernado Ugolini. He was accompanied by several servants, a handful of guards and clergy, including his Estalian secretary Duarte, followed by a cart carrying his personal baggage and a small body of Reman militiamen who had recently become noticeably more conscientious in their duties, now that they were accompanying not merely the Lector of Viadaza, but rather the holy father of the whole Church of Morr. 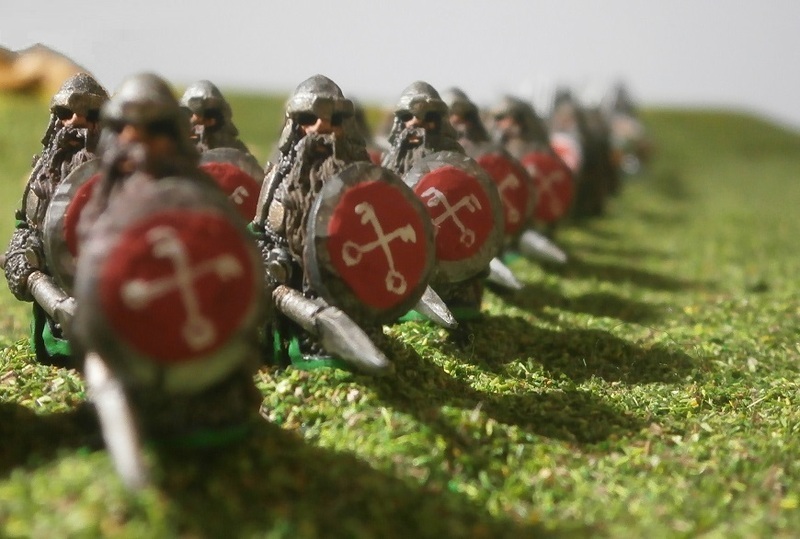 The Reman cross-keyed standard was carried before Bernado, while off to his side marched a column of iron-clad dwarfen mercenaries who also sported the crossed keys, painted on their shields. They had served in the miscellaneously mercenary Reman army for more than a decade, along with regiments of Cathayans, Empire soldiers and even some elves. 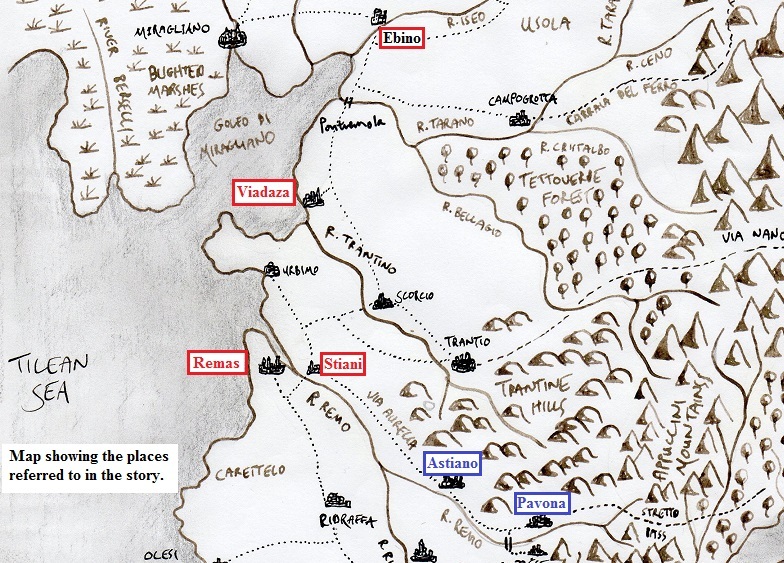 In truth, Bernado would much prefer to be riding northwards directly to Remas, not chasing ogres to the south. The city and the holy church of Morr were in turmoil, since before his election to the arch-lectorship, and even more-so now. As the church’s chosen ruler, he should be there to guide his flock, heal the divisions tearing the Morrite clergy apart and ensure Morr’s protective presence. Duarte and his all his other advisers agreed, however, that the situation was now so bad there was little he could do without an army to back him, which meant travelling wherever the Reman Captain General, Duke Scaringella and his army went. When he finally returned, not only did he need to be with them, but also to be one of them. While the arch-lector Calictus II had died at Ebino fighting against the vampire duchess, Duke Scaringella had been leading a small army eastwards to join with Pavonan forces and defeat Razger Boulderguts’ double army of ogres before they reached Remas. At the ruinous city of Astiano the duke had rendezvoused with the joint force of Remans and Pavonans sent away from the ‘Holy Army’ by the arch-lector a little while before his disastrous defeat. (This was the force Bernado had himself commanded as it marched south.) Then, knowing he still had insufficient forces to fight the ogres, the duke had waited, allowing Boulderguts’ army to swing around the north of the city, travelling east to west. He was gambling that as the ogres had already razed Astiano they would have little interest in doing battle there again, this time with no prospect of plunder, whilst praying that the main Pavonan army would reach him in time before the ogres tore Remas apart. It was a big risk, which nearly every one of the duke’s officers advised against (even if they could not agree what alternative action should be taken). His inactivity meant the very force he had been sent to stop had got between him and what he was meant to be protecting! Luckily, just as news came that the town of Stiani had already been razed to the ground, and it looked like the entire realm might soon be destroyed, Duke Guidobaldo Gondi arrived at the head of the main Pavonan army. It was a force bigger than Scaringella’s, made bigger still when the Pavonans who had come south from Viadaza rejoined their comrades. Several days later the duke’s only surviving son, Lord Silvano, one of the very few who had escaped the terrible defeat at Ebino, also arrived to be reunited with his father. Then, in an even more welcome (and entirely unexpected) development, the army’s scouts reported that for reasons known only to the ogres, the tyrant Razger Boulderguts and his mercenary ally Mangler had turned southwards rather than striking towards Remas, where the real wealth lay. Had they overestimated the forces defending Remas’ mighty walls? Were they making for the coast and some awaiting ships? Was the sudden change of direction part of a secret agreement with the vampire duchess? Or were they merely taking a detour? Whatever the reason, the allied army now had a chance to do battle with the ogres before they wreaked any further destruction upon the realm. Other than the clattering of their layers of steel armour, the dwarfs marched in silence. They were armed with strangely short spears, of a sort that could be used as a blade like a short sword, but were better at thrusting out between the interlocked iron of a shield-wall. The dwarfs had become a common sight on the streets of Remas, and since their incorporation into the city’s standing army, the dwarfen quarter had swelled considerably in size. 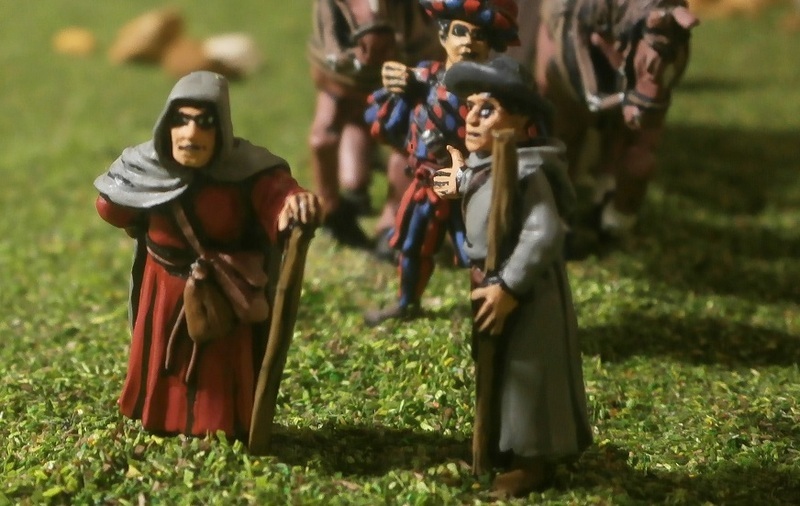 There had been mutterings in the army that the dwarfs were surely not happy to be allied with a Pavonan army, what with Duke Guidobaldo’s expulsion of every dwarf in his realm two years ago. The dwarfs themselves, however, had apparently said nothing concerning the matter to anyone else. Bernado suspected that rather than anger, it was mirth they were concealing – being secretly satisfied at the Pavonan soldiery’s discomfort. If the Pavonans disliked merely camping and marching beside dwarfs, then what did they make of the prospect of relying on them in battle? Perhaps the dwarfs intended to shame the Pavonans with their sturdy prowess and hardy discipline upon the field of battle? It was late in the afternoon, which on any other march would mean the army should be halting soon. Not this army though. If the last four days were anything to go by, they would march until it grew properly dark. Ogre legs were longer than those of men. Despite being distracted by the discomfort of riding a mule (the traditional mount for a lector), and worrying about the forthcoming battle, Bernado had been attempting to think clearly about the situation in Remas, to decide what his best course of action would be. He had learned of his election only two days ago, the news being delivered by a lowly, but respected and trusted priest named Benvenuto, who had killed his horse in his haste to bring the news. Benvenuto also described the recent violent events in the city. Since then, due to the consequences of the civil unrest, the speed of the march and the fact that the army of ogres ahead were burning a path through the realm, killing (and eating) just about everyone they encountered, he had learned nothing more. Still, what he already knew was enough to fill him with concerns. As usual, Duarte did not answer immediately. He was a careful, disciplined thinker, of a philosophical bent, and not one to rush to answer even when asked by the arch-lector himself. Bernado had already been thinking along similar lines. Overlord Matuzzi had handed over the reins of secular power to Calictus II, Bernado’s predecessor, making him ruler of both church and state. Until the election, the big debate had been whether or not the new arch-lector would automatically inherit that secular authority. Now, however, a third player had entered game. “He would have me become a ceremonial puppet while he wields all the real power,” said Bernado. Although perhaps, he thought to himself, a demagogue like Carradalio and his fanatical Disciplinati were exactly what Remas needs? He had seen so many flee from the undead at Pontremola, and knew full well the final victory had been because of General D’Alessio’s bravery and skill alone. Yet only last night he had heard young Lord Silvano telling of the battle at Ebino - how the flagellants had plunged deep into the enemy’s line and died fighting to the last despite the many monstrous horrors in the duchess’s army, and regardless of the everyone else’s flight. What could a whole army of fanatics do? Perhaps such warriors were Tilea’s only real chance against the vampires? He missed the council of Father Biagino, a man who had both the gift of prophecy and a mind sharp enough to avoid ill-thought or hasty assumptions. When he had asked Lord Silvano about Biagino’s fate in the battle at Ebino, the young noble simply said he never saw nor heard of the priest since that day, and so thought it most likely he perished amongst the multitude. “Are you well, your Holiness?” asked Duarte, concerned at Bernado’s posture, his frown obscured by his hand clutching at his temples. The arch-lector had been so deep in thought he had not realised what he was doing. Durate gave the command, and those fore and aft of the arch-lector came to a halt. The parallel column of dwarfs continued its march, while Bernado turned his mule to face the two priests on foot behind, and Brother Duarte followed suit. Benvenuto wore a grey, hooded cloak, and despite his sturdily built frame, leaned ponderously, bent-backed, upon a staff. The heavy, leather bags hanging at his waist were at least partially to blame, but he would not allow them to be put onto the cart. When the priest had reached in to withdraw the letters he was carrying, Bernado had seen weighty tomes inside, dark leather embossed with gold leaf. Holy books, or perhaps ledgers of some kind? Bernado assumed he would discover the truth should Father Benvenuto feel the need to employ them. “Yet Viadaza, my own see, was lost that very same week,” interrupted Bernado. He felt no joy at the irony. Ah, thought Bernado, but what sort of army will we return with? If we are badly mauled in this coming battle, only the battered rump of an army might remain. And even if sufficient force survived to contend with the Disciplinati’s fanatics, would Duke Scaringella do the right thing and restore the proper order? “I did, your holiness,” the priest answered. “I take it he questioned you concerning Remas?” inquired Bernado. Although Bernado had seen the Captain General since that meeting, when both Scaringella and Duke Guidobaldo came to receive his official blessing (as their new arch-lector), he had not yet had the opportunity to speak with Scaringella privately. He doubted the general would want to discuss the precarious state of Reman affairs in the Pavonans’ presence, especially in light of the unexplained delay – lasting the best part of a day - which occurred the previous week. 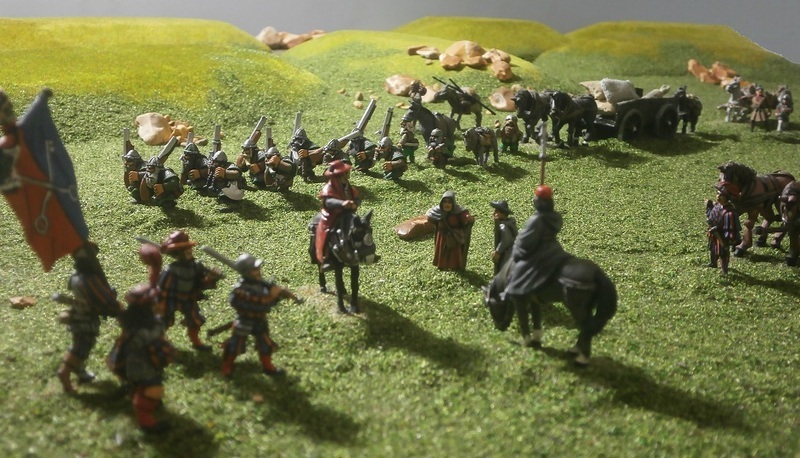 During that day, as they waited for the Pavonans, Scaringella had confided to Bernado his suspicion that Duke Guidobaldo did not actually intend to fight the ogres and was considering some other action instead. Perhaps the captain general had the measure of Duke Guidobaldo of Pavona? Yet he also admitted he could not fathom why Guidobaldo would consider allowing those who had injured him so badly to escape. Fearing his dangerous gamble had failed, Scaringella had knelt to pray with Bernado for Remas, pleading with Morr not to allow it to suffer at the hands of brutes when the most holy work of destroying the vampires was yet to be done. 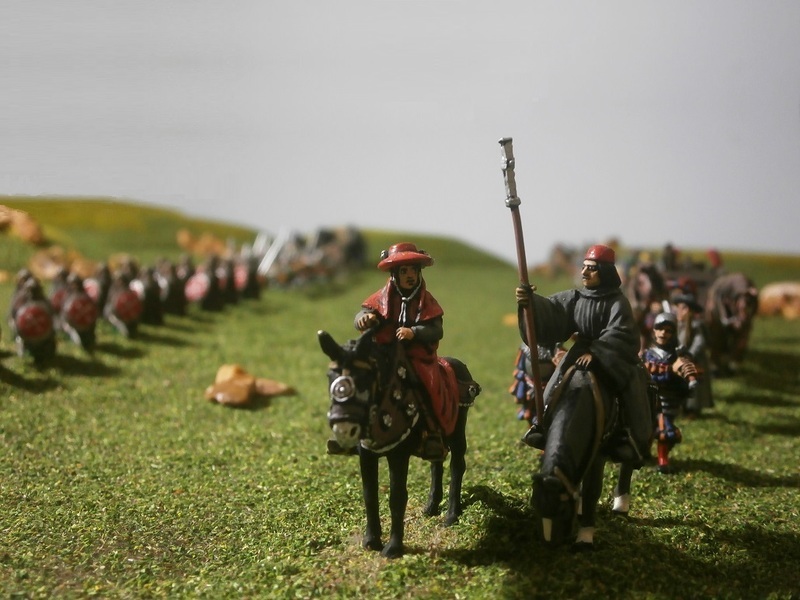 That evening, however, Duke Guidobaldo called a council of war, giving no explanation for the delay, and declared that they would pursue the enemy immediately as if nothing strange had happened. Although Duke Scaringella accepted Guidobaldo had the larger force and so was due the precedence, he was neither asked nor offered to swear obedience to Duke Guidobaldo, being himself was of equal noble rank and a captain-general (which suited him well in light of his distrust). 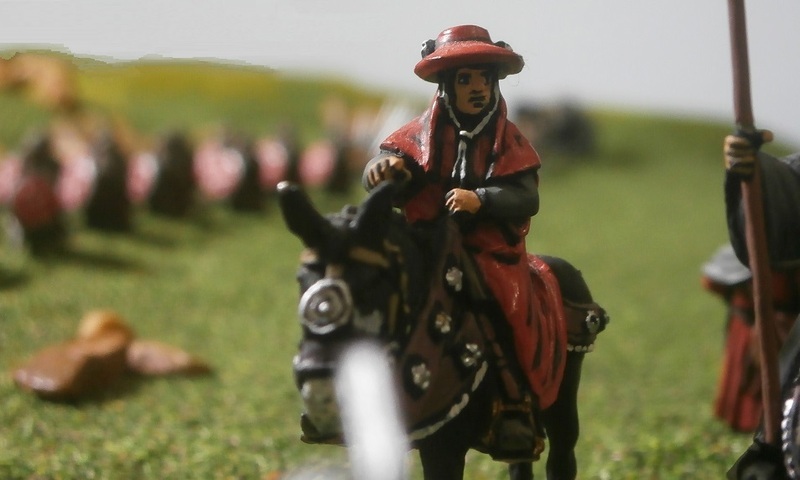 Instead, he simply offered to fight at Duke Guidobaldo’s side, promising to cooperate fully upon the field of battle, doing his utmost to contribute to victory. The matter of dividing the spoils was not discussed for the chase was on and there was no (more) time to waste. Most of the soldiers seemed to presume that as most of the plunder came from Pavonan settlements, then the Pavonans would expect the lion’s share. Father Benvenuto nodded his acceptance. “Did Lord Scaringella voice his opinion concerning Father Carradalio and his dedicants?” Bernado asked. Ogres, fanatics and the undead, thought Bernado. Not one but three wars to be fought! Last edited by Padre on Sat Dec 16, 2017 7:16 pm, edited 2 times in total.